Wurms KV and Hofland-Zijlstra JD (2015). Control of powdery mildew on glasshouse-grown roses and tomatoes in the Netherlands using anhydrous milk fat and soybean oil emulsions. BOTRY-Zen® has been used for several years on peony roses. Regular applications of BOTRY-Zen® throughout the season result in fewer stems dying off at ground level due to Botrytis rot, and strong, healthy foliage. Botrytis causes stem rot at ground level in developing peony shoots. The shoots fall over and are no longer able to produce a flower. This study was conducted by a grower who applied BOTRY-Zen® and another biological control agent to rows of peonies every 7 days. 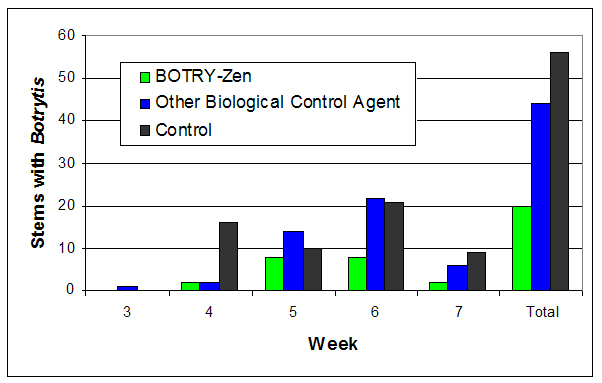 BOTRY-Zen® significantly reduced the loss of stems to Botrytis over this period of risk.